CSU-Global's Undergraduate Certificate in Networking* can add value to the IT knowledge and experience you already have. The courses in this certificate program can also help you prepare to sit for six different IT certifications. 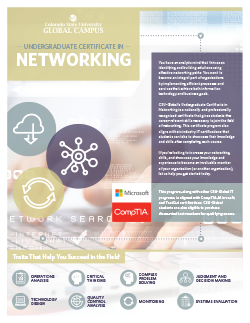 If you’re ready to take your IT career to the next level, earn this nationally and professionally recognized certificate to prove your commitment to the field and your expertise in networking. Implement security measures and techniques for local and wide area networks.